While driving along a suburban back road, Hilary Cantor, who's just lost her job and whose deadbeat husband has left her to care for her son who has Asperger's, witnesses a freakish accident when a deer suddenly darts in front of the car ahead of her. The driver careens down a hill and slams into a tree. Rushing to help, she discovers the car smoking, the driver dead—and a satchel on the floor stuffed with a half million dollars. That money could prevent her family's ruin and keep her son in school. In an instant, this honest, achieving woman who has always done the responsible thing makes a decision that puts her in the center of a maelstrom of unforeseeable consequences and life-threatening recriminations. It isn't long before someone comes looking for the money, and as they get closer and closer to Hilary, she is pulled into a terrifying scheme involving a twenty-year-old murder, an old woman whose entire life has been washed out to sea by the storm, and a powerful figure determined to maintain the secret that can destroy him. With everything to lose and putting everything she loves at risk, Hilary joins up with a dogged police official from Staten Island who has his own connections to the money and is dealing with his family's tragic struggles in the aftermath of Hurricane Sandy. Together they must fight to bring down an enemy who will stop at nothing to keep buried what that money was meant to silence. 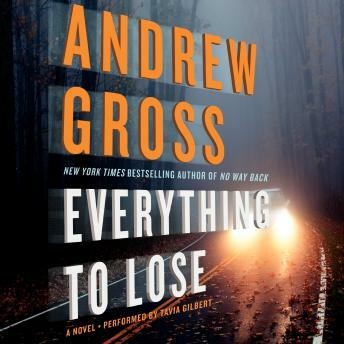 Everything to Lose is a propulsive thriller filled with tension and unexpected twists. Pitting an ordinary woman against powerful and desperate figures, this explosive and heartbreaking tale of suspense will appeal to readers of Harlan Coben, Lee Child, and David Baldacci.